Palestinian Arab terrorist stabs man outside of Jerusalem; perpetrator still at large. 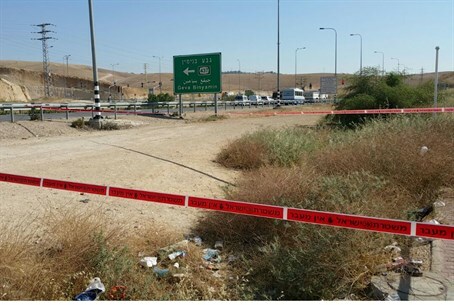 A Palestinian Arab terrorist stabbed a Jewish man at the Al-Zaim junction, 11.3 kilometers outside Maaleh Adumim and just outside Jerusalem, on Monday morning. Magen David Adom (MDA) medics were notified of the attack at 7:53 am and rushed to the scene; they treated a 19 year-old victim on-site and then transferred him to Shaarei Tzedek Medical Center in Jerusalem for treatment. The victim was stabbed on the left side of his upper back; MDA has rated his injuries as "moderate." The terrorist is still at large; police are scanning the area to find the perpetrator.